Chris Farley… I don’t know where to start. 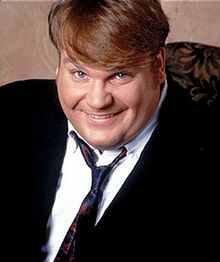 I miss Chris Farley. He was funny as hell. He was as good a physical comedian as anyone ever saw. Saturday Night Live – Some of his skits on SNL are the funniest ever. They will not be topped and they will go down in the annals of that show. Whether he was dancing as a Chippendales dancer with Patrick Swayze or living in a van down by the river – he was always on. Tommy Boy – He and David Spade were made to make movies together. His man-child act at its greatest. Beverly Hills Ninja – If you don’t like this movie you have no soul and you probably don’t know funny. The great white ninja – cracks me up just thinking about it.